Voorheesville is a relatively small place. 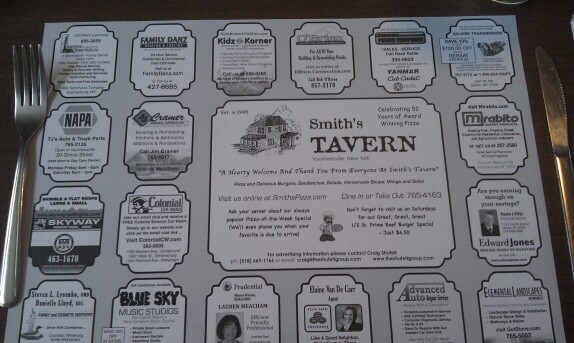 Within the 2.1 square miles of the village, almost smack in the center is a little place called Smith’s Tavern. It’s more or less your standard neighborhood bar. Cassie, who grew up in Voorheesville, took me to Smiths when we first started dating. She really wanted me to try the pizza. Since then, it’s become one of my favorite places to go for a good pub style pizza. Inside, there are two main areas, a front bar area with some small tables and a larger area in the back where there are some banquet tables and chairs. There’s lots of wood around the place; inside, you’ll feel like you’ve been transported to a bar in the 1970s. That’s not to say it’s bad, because it obviously still works. 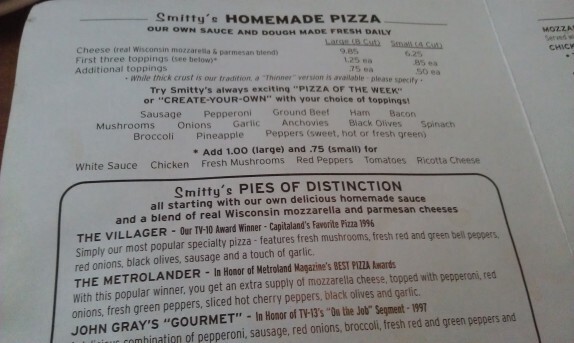 One Saturday, my brother and my uncle joined me for some pizza at Smith’s, which also has the reputation of being called “Smittys” among the locals. 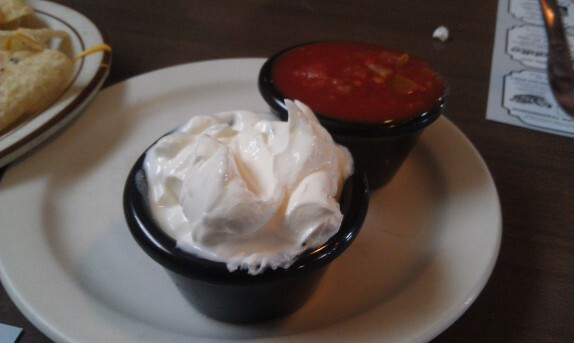 We decided to start with an appetizer and to bulk up on pizzas. The menu is fairly simple. There are a few appetizers, most of which are baked since they don’t deep fry, some salads, some sandwiches (I hear the Reuben is awesome! 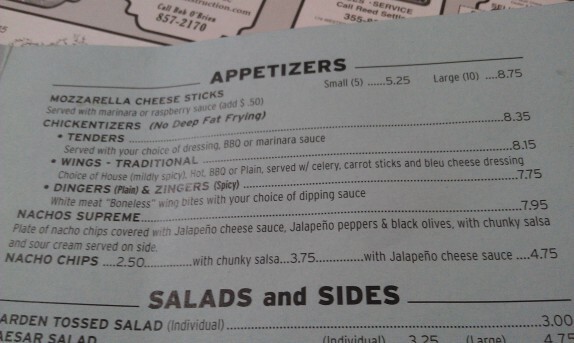 ), and lots of pizza options. 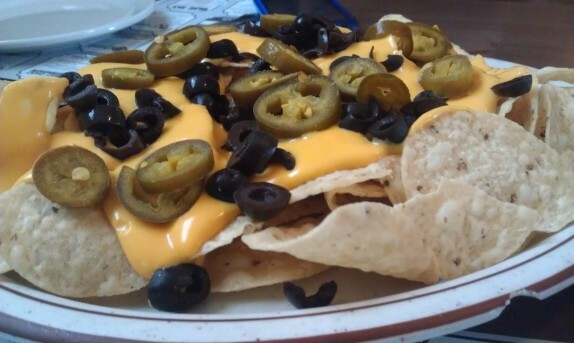 We opted for nachos supreme since I wasn’t keen on the chicken fingers I’ve had there in the past. While this was nothing more than some pre-made ingredients thrown together on top of bagged tortillas, the portion was hefty. 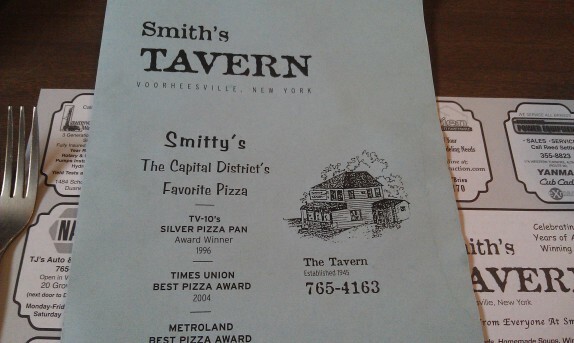 But the pizza is really the main event at Smittys. 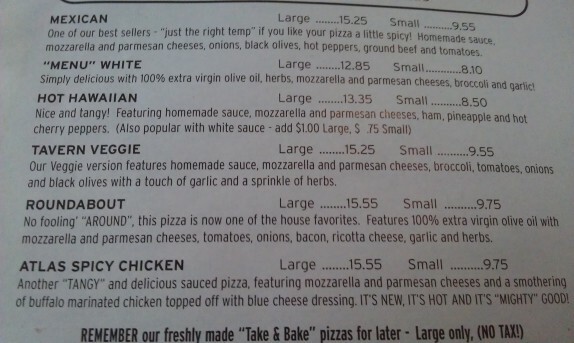 For the price, I would classify all of the pizzas as a great deal. 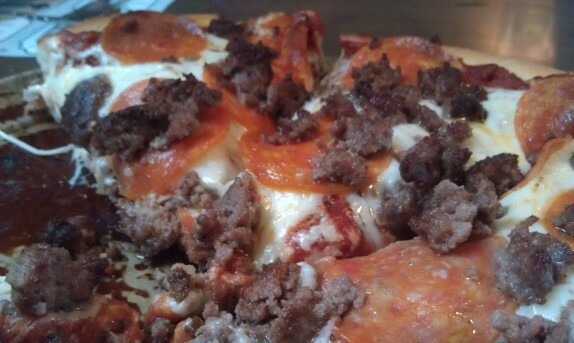 The crust is thick, the cheese is plentiful, and they don’t skimp on toppings. The large is really enough for at least three people. We ordered a large with pepperoni and ground beef topping ($12.35). 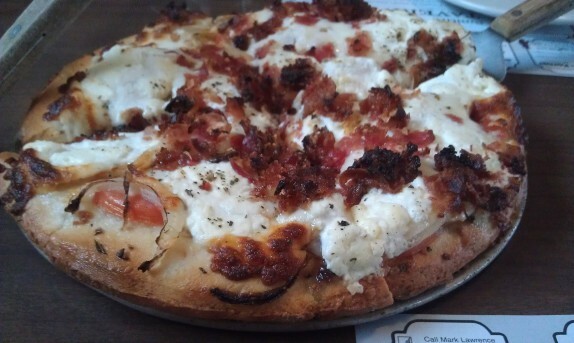 And we also ordered a small “Roundabout” (bacon, fresh tomatoes, onions, mozzarella, parmesan and ricotta cheeses, garlic, herbs, and olive oil – $9.75). This pizza isn’t the New York type that’s cooked in a dry brick oven. Although it’s cooked in a heavy pan with oil like Chicago style pizza, the crust isn’t flaky and brittle. 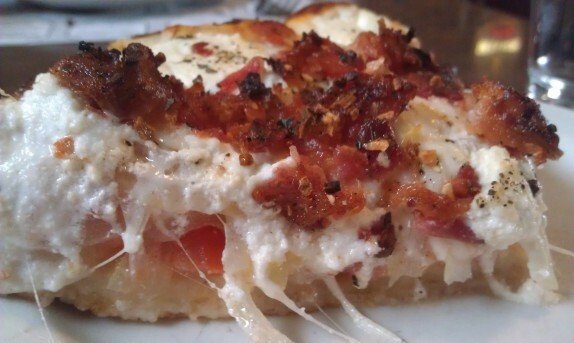 The crust at Smith’s is dense, chewy, and crispy, and the toppings meld into it. The pizza reminds me of my childhood memories of Pizza Hut (before the crust got so airy that it disintegrates as soon as you bite it). A slice of this pizza is substantially heavy, and that’s without the toppings! 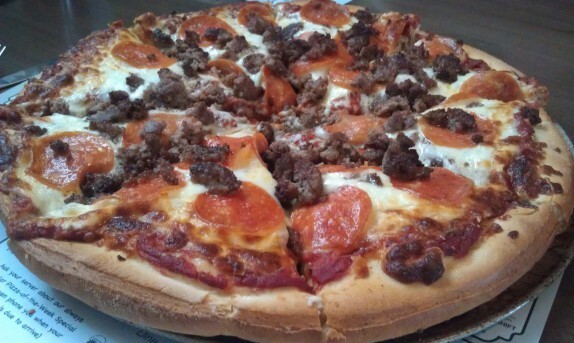 The pepperoni and ground beef pizza was very good. The ground beef on its own had little seasoning, but it picked up some spices from the pepperoni. The roundabout was really interesting. It was impossible to pick up a piece without the spatula. With the three cheeses and garlic, it’s extremely rich. Throw on some bacon, drizzle on some olive oil, and it’s over the top. Delicious, but over the top. The tomato and onion serve to cut through a lot of the fat and add some flavor. Needless to say, the three of us didn’t finish the pizza, and we walked out of there stuffed. The bill came to a little over $30, and that included a couple of sodas. It was fun to look around and see the handful of families with young kids sharing pizzas. And it was also fun watching the model train set circulate around the periphery of the restaurant. The staff is also really nice. It really is the type of place that belongs to the community. It’s awesome that your reviews always cover my favorite places. If I’m going to drive south for tavern style pizza, this is the place I go to. I’m keen on the metrolander. The cherry peppers are to die for!